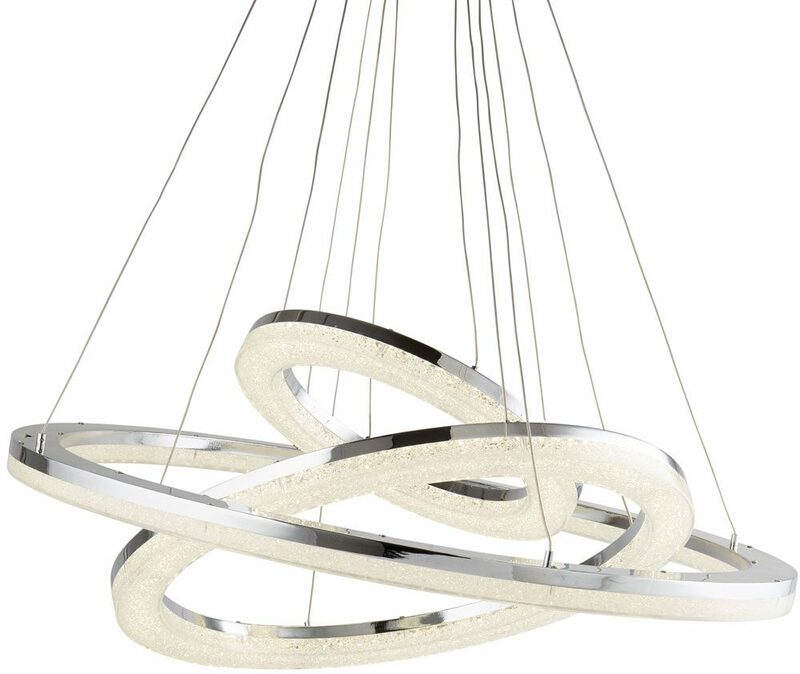 This Circles 3 ring LED ceiling pendant in polished chrome with acrylic ice is contemporary, stylish energy efficient and very bright. Featuring a ceiling mount and multi-wire suspension supporting three different sized chrome circles that fit inside one another. Each circle is fitted with cool white LED’s and features a diffuser covered in acrylic pieces which sparkle like crushed ice when illuminated. The three rings can be adjusted to any angle for different lighting effects to suit your room. This opulent and beautifully elegant chrome ring pendant features 3 cross over rings coated in crushed ice. The lights hang on slim chrome wires that help to add the wow factor to your interiors, particularly living rooms, bedrooms and dining rooms. A very bright contemporary LED ceiling light that provides 3900 lumens of light. Adjustable at the time of installation by shortening individual wires to suit different configurations. A class 2 double insulated product, no earth required. This contemporary light is supplied by Searchlight who manufacture some of the best traditional and modern classic designs such as the Circles 3 ring LED ceiling pendant in polished chrome with acrylic ice you see here.